This week's Sweet Sunday Sketch Challenge card uses some fabulous products from the new Occasions Mini Catalog ... With All My Heart Stamp Set, Sending Love Specialty Designer Paper, and Extra Large Fancy Flower Punch. 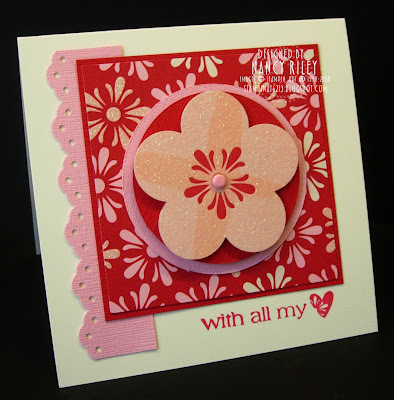 The center flower was created by punching out a flower from the gorgeous Sending Love Specialty Designer Paper with the Extra Large Fancy Flower Punch. The only stamping on my card is the sentiment from With All My Heart stamp set in Real Red. Simple, Simple! Thank you for your overwhelming response to the 5/8" Satin Ribbon Share! If you ordered your shares and paid prior to January 28, you are part of the first five share groups. The ribbon for those groups arrived at my home yesterday, and I'll be spending my weekend cutting, packaging, and preparing for shipping. I plan to have them shipped out by Monday, Feb. 1. If you ordered ribbon shares and paid on or after 1/28, you are part of the 6th group that is still be formed. I will continue to form new ribbon share groups as long as there is an interest. Once payment is received from an entire group, an order will be placed for the ribbon, and the share will be turned around as quickly as possible. 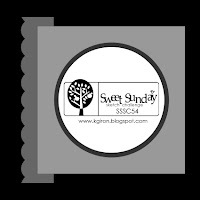 Click here for more 5/8" Satin Ribbon Share information. Last night was our monthly weSTAMP meeting and swap. I haven't had time to photograph all the fabulous swap cards yet, but did manage to snap a photo of mine prior to the meeting. My card is a variation of this card I designed last week which was inspired by this card Fran Sabad, and this card by Chat Wszelaki.